The Ford Mustang entered its fifth generation in 2005 as a completely redesigned car with a chiseled, squared-off look, closely resembling the look of the late ‘60s models. Editor’s note: This is the 28th in a 30-day series featuring cars from the Tammy Allen Collection to be sold October 13-15 at Barrett-Jackson’s 2016 Las Vegas Auction. The Ford Mustang entered its fifth generation in 2005 as a completely redesigned car with a chiseled, squared-off look, closely resembling the look of the late ‘60s models. To celebrate Mustang’s 45th anniversary year, Ford created a car in 2009 to honor Lee Iacocca, the Ford executive who had championed the production of the original Ford Mustang. 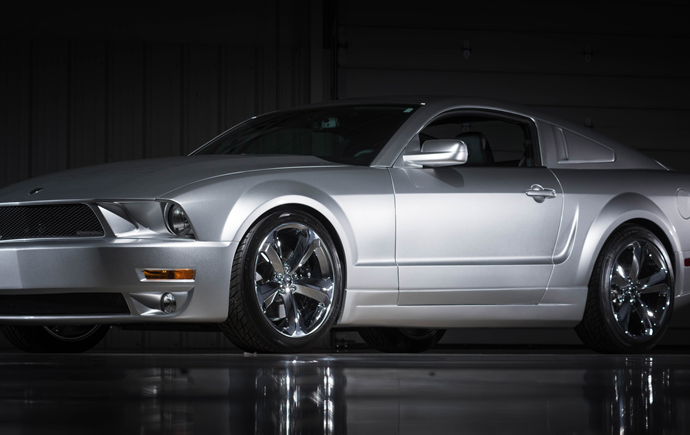 Offered from the Tammy Allen collection without reserve, this 2009 Ford Mustang is one of only 45 special-edition cars built and sold that bear Iacocca’s name. The special edition was designed by Michael Leone and while largely based off the fifth-generations body, it features a unique roofline that pays homage to the original fastbacks, while the front has been reworked with sunken headlights and a slanted grille. The Iacocca Mustang was coach-built by the Gaffoglio Family Metalcrafters, a company known for building many automakers’ concept cars. It features the same composite construction used in the aerospace industry and on vehicles like the Ferrari Enzo, F40 and McLaren F1. Each car features an Iacocca signature plaque with serial number, Iacocca badging, Iacocca diamond-design embroidered leather seats, custom silver paint, Ford Racing handling package, complete Ford Racing suspension and high-performance Brembo brakes. This Lee Iacocca Mustang is car No. 5 and was given some additional enhancements to be sold at a Barrett-Jackson Auction. It has a 4.6-liter V8 engine with a 5-speed manual transmission. It is specially equipped with a Ford Racing polished supercharger, a polished aluminum overflow tank, power steering tank and chrome valve covers and has 1,230 actual miles. This 2009 Ford Mustang 45th Iacocca Anniversary Edition and the rest of the Tammy Allen Collection will be crossing the block at no reserve as part of Barrett-Jackson’s ninth annual Las Vegas Auction, October 13-15 at Mandalay Bay Resort & Casino. For more information, visit www.Barrett-Jackson.com/Bid or call 480-421-6694. Absentee bidding options powered by Proxibid are also available.